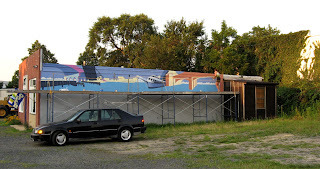 Following my work on the tower block at the Studio, I drove right to the BAC to continue on the mural. Due to various situations it's been 2 weeks since my last painting session, but others had been busy. Our pro Beth over two sessions of her own worked on the water areas, adding lighter wave forms over most of the surface, and darker shadow/reflections under the bridges and piers and along the boat. And Pat had worked the condos on the left. She was back today, over on the far right. Meanwhile, I went back to the railroad areas. I mixed up a light gray from our Siperstein's stash, using a South Port/White mix, and adding a little Chamois Shirt. This would be used to do the railings under the raised rail bridge. Over to the fixed girder bridge, where I used the Grand Grape to repaint the dark girders, making them more regular and adding an indented shadow area. I then mixed my two colors together to make a slightly lighter version of the dark girder color, which was used as a highlight to give the bridge a little more 3D feel. Click on the lower photo to see the details. I started today with the boat ride, making the changes I had planned after the last session. 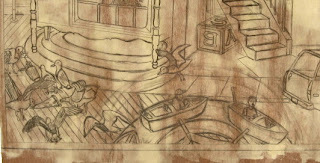 The perspective is now definitely more consistent with the rest of the scene, especially when I compare it to the initial version of the ride drawing. I added in a couple of kids, but decided not to put in that suspended upper ring. I think this is pretty much done. Then on to the gulls. I moved one that had been along the bottom edge to a higher position, replaced it with a soaring bird, then added another gull to the right above the ride. This has a logic, as once a gull discovers a food source, it isn't long before every other gull in the vicinity is rapidly descending on the spot. Visually, it will help bring some of the gull shapes and colors further across the composition. This area is more or less done, too. And with that, the first version of the block drawing is finished. All the planned areas are accounted for. I'll back off a few days (I can use the time to get ready for fall classes), then look with fresh eyes. Assuming nothing major is bothering me, I will still need to go in and start fixing details, but it's nice to know that basic composition is set. 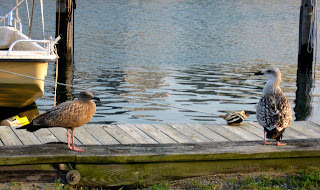 The last couple of days I took walks across the street to Stockton Lake in search of more sea gulls to photograph. Not as many around as I had hoped, and none were hanging around close to where I could stand. (the gulls that frequent the amusement boardwalks are less skittish- I've seen them actually swoop down and try to grab food out of people's mouths) Used my zoom and a higher res setting to get what I could get. 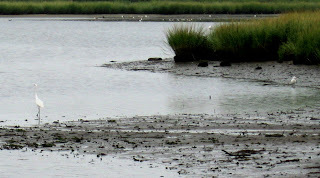 Top photo is a typical result- though the egret is easier to see than the tiny gull on the far right. Took what I had to the Studio this afternoon and started drawing my gull flock eating assorted dropped boardwalk treats. Some birds are based on my photos of the past few days, some are sketches from internet sources. I may make changes in this grouping, but the idea is coming along. Next I went back to the boat ride. Decided to start over completely. I was never happy with the perspective, and today I realized that the boats were backwards. The actual ride has the boats travelling in a counter clockwise circle, and when I did my sketch at Pt Pleasant, I drew the one closest to me, pointing to the right. 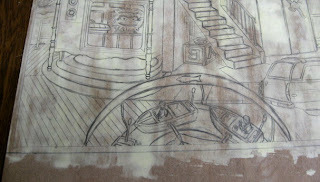 When I started recreating the ride on the block I reversed the boat to point to the left- standard procedure, but I had forgotten that I wasn't drawing the foreground boat, but the one across on the far side of the ride, which would have been pointing to the left in my original view. So on the block drawing, the boats should be pointing to the right. Kind of a rookie mistake, but it was an excuse to just erase the whole thing and start over. The new version isn't quite there, but it's closer than any of the previous versions, and I know what I need to do to fix it. I haven't yet decided if the raised rim will go back or not. It gave me so much trouble before, I don't know if I want to deal with it again. After work today I took a ride down by the Manasquan municipal marina along Perrine, where I know from experience gulls tend to come around. The best time to see them is usually around low tide, when they can pick at stuff exposed by the receding water. Unfortunately, today's low tides were during the work day, and very late tonight, and I was there at near the high tide mark. Still, I found one pair (herring gulls I believe, shown above) hanging around where I could take some photos of them in various positions from my truck. Tomorrow I'll try my luck at low tide at nearby Stockton Lake, another place where they congregate. Meanwhile I did a bunch of sketches of gulls from internet sources tonight. One way or another, I should have enough to work with to do my gull sketches on the tower block the next time I'm in the Studio. I went to the Studio right after work, with the immediate concern preparing for a visit from the collectors I had met with a few weeks ago. The prints were ready and signed, and I had even made glassine folders for them yesterday. I thought it a good idea to provide a safe way to get the prints home, so I had grabbed a large piece of corrugated cardboard before leaving home this morning, leaving it in the back of my truck. In the Studio I cut, scored, and folded, making a quick portfolio case- crude, but effective, certainly good enough to keep the prints safe in the short term. I saved one last step for my visitors arrival, stamping with the chop mark. Usually I put it in a lower corner of the sheet, or on the back where it won't bleed through (especially with group folio editions), but this couple wanted it in a place where it would be visible even if matted, so they requested that it go right next to the signature. Prints and money were exchanged and everyone was happy. As long as I was in the Studio, I figured I should do a little drawing. I fixed the 6 on the motel sign (top photo), making it look more like the actual sign would. This area is done. Back down to the boardwalk area, I tried another version of the top ring of the boat ride, at least on the left side. Still needs work. Next to it I finally started playing around with the last piece of the composition, which I decided will be some sea gulls picking at spilled food- pizza and fries. The problem is that I can't quite figure out how to accurately draw the gulls. I had my bird book with me, but all the images are eye level profiles of birds standing or soaring. I need to see what they look like from different angles, bent over, hovering before landing, etc. So either I need to find some better references, or just go down by the beach and do sketches or take some photos of my own. But on a day nicer than this, as we suffer with our 4th straight day of rain. Today I worked on 4 pieces of the drawing. I started with the boat ride. I figured the key was changing the suspended rim (with the fish) around the top. Played around a bit, left it as seen in the second photo. I think it's a little more consistent now with the rest of the ride. I'll wait a while before I come back to it again. If I can't work it out, I can always remove the top and just go with the boats and the trough. Then I moved over to the station wagon. My original reference from the family photo album showed it at eye level, and drawing it that way had it in a plane different from all the ground around it. I brought it a bit closer to the reality within the scene by making minor changes to the back bumper/tailgate/window section, to the roof and luggage rack, and to the wheels. It makes a bit more sense now in itself, and it even makes the boat ride look better by not pulling away from it as much. Next I moved to the area on the right above the train (top photo). For the third time I drew the hillside Tuscan village of Castelnuovo, making the buildings a little smaller so I could bring in some of the greenery below it, to help it separate a little better from the train and tower. It's done. Then I did some highway signs. I decided to add a third sign post so I could have a gas/food/lodging cluster, as one commonly finds on interstates in the wide open parts of our nation. Two are common sights from my midwest travels- Motel 6 (I have to redo that one) and Waffle House (which doesn't even have a location in NJ). For the gas I decided to go with Esso, which was more of an eastern brand and as far as I know the name hasn't been used in this country for a few decades. 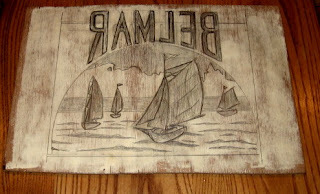 But since this piece has a lot to do with my past, I thought a vintage brand from my youth would be appropriate. Originally I had the 6 in the middle, but decided to move it over, so I could separate the two red, white, and blue signs. After I fix that 6, this section will be done. Today's work on the tower block continued the foreground area around the base. 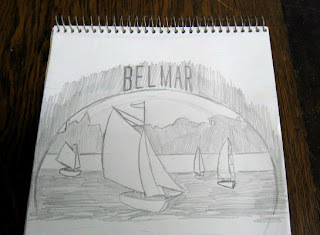 I put to use one of my boardwalk sketches from the other day, putting in the kids boat ride. Seen by itself (top photo), the drawing looks pretty good so far, but when seen in relation to everything else (bottom photo), the perspective doesn't match the rest of the scene. So I am going to have to go back into this during the week. I can accept the boats being seen from overhead a little, it even kind of makes sense considering where the eye level seems to be. I think the problem is the ring suspended above the ride, the thing with the fish design in the middle. If I change the curve on that a bit I can make it feel more like it sits in the same space as the everything else. I will also need to put something in the space to the left, the empty stretch of boardwalk. It could be a piece of another ride, or some other bit of boardwalk culture. Spent a bit of the afternoon driving to Mercer County and back. In between I was at a housewarming party for the newlywed couple whose house I helped paint back in March. The painting job is now finished, furniture is in place, and art on the wall, including something of mine- a colored print I did for their "save the date" postcard. I couldn't stay long today due to another commitment, but I did have a snack and took care of some business. First, I finally turned over to the couple their wedding present, the St Budoc print. I brought it with me back in March to show them, but with everything in disarray, I thought it best to hold onto it until they were ready. I'm told that after framing it would likely hang in the master bedroom, by the person who generally makes that decision. The other bit of business was to see if the bride would be willing to help out with a future project. I thought she'd make a good model for the portrait/figure piece that I had been thinking about since January, but the last person I asked to help me with this one eventually decided against it. I had better luck today- my friend says she's willing to pose. I told her I'd get in touch with her in the fall, after I get the tower project more or less finished and we've gotten past the first few weeks of our respective fall semester classes. 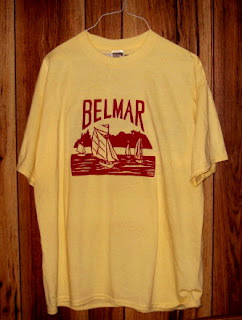 At long last, the Belmar t-shirt I designed is available to the public. It went on sale at the Luau and Regatta weekend event at the L Street Beach in Shark River in Belmar. Tonight was the Luau and Boat Parade, tomorrow (Sunday) will be the Regatta itself. 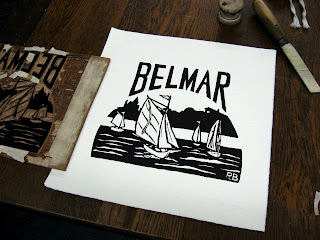 The shirts are being sold by the Belmar Arts Council, along with art from members, at the boardwalk from 10 am to 3 pm. As you can see, it comes in yellow or green, and sizes S, M, L, and XL, all for $10 each. If you can't make it to the Regatta, they will be for sale later through the BAC at the Boatworks and at many of our events. A week ago I mentioned the question of whether or not I'd be participating in the latest Art Walk in town. Time to follow up. A few days ago I made the decision not to participate. One concern had been getting there early enough on a Friday afternoon that I had been scheduled to work, but that probably could have been dealt with. Of more concern was that I had just too much to do over the next several days and couldn't see myself having time to prepare everything that would be needed. Also of concern would be having to set up by myself and the predictions of bad weather. So I left a phone message and e-mailed, to make sure it was known that I wouldn't be showing up. The good side of not being a participant was that I could be a spectator- walk around, talk to the artists, see the art. And the forecast had even been changed to nice weather. Problem came this afternoon around 4:30 when I walked out of my work location and saw massive blue-black clouds to the north. Not so good. 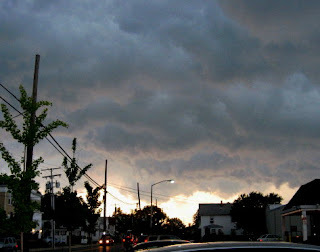 Got on the road south fast enough that I hit minimal rain, but parts of it had already swept through Manasquan. Before going home I drove down Main, just around 5 pm (planned Art Walk starting time) and saw maybe 6 people set up so far, but the weather clearing. I decided to take care of stuff at home for a while, give the artists more time to set up. About an hour later, with sun shining and radar showing clear skies, I took a walk downtown. Of the 30 artists who were expected, maybe a little more than half were set up. I walked up one side of Main, stopping to talk to artists I knew (from the BAC and Manasquan River Group) on a few occasions. Down the end I crossed over, and a little distant thunder was heard. Moments later the blue-black clouds were back, coming in fast from the west. And the artists were scrambling to take down their displays, about an hour ahead of schedule. The street grew dim, the wind picked up. Time for me to get walking home. After what happened in Asbury a few weeks ago, I had taken the precaution of bringing my umbrella. 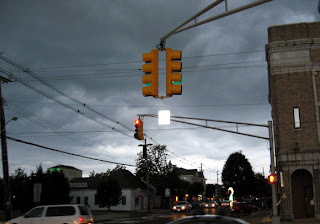 As it turned out, despite the dark gray clouds that quickly covered the town (see above photos of views at the intersection of Main and Route 71), rain didn't actually arrive for another hour. So in the end it was a little disappointing, especially as some of the stuff I saw being packed up on my way back looked interesting. Lets hope for better luck next time- there's one more Art Walk type event coming up this year in October. 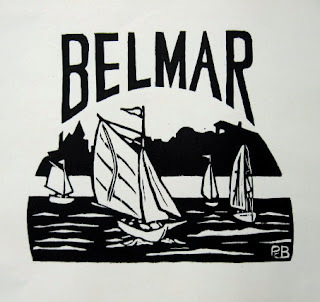 I attended a meeting at the Belmar Arts Council this afternoon that dealt with scheduling over the next few months. My reason for going was to nail down some information regarding an upcoming show. Back in March I took Best In Show in the BAC Juried show, which came with two prizes. I received a gift certificate from a frame shop in town, and myself and the 3 honorable mentions were to get a group exhibition in the Boatworks, dates to be determined later. Today we got a little closer to figuring it out. The artists can start installing the show on Sunday, Nov 4, and will take it down Sunday, Nov 18. There will be a reception on one of the Saturdays in between, day and time yet to be worked out, as well as open gallery hours. I guess we'll be dividing up the walls of the gallery evenly among us, so I should be able to put up quite a bit of work. I'll post more details about times and dates and content of work as they become known to me. One of the last visual references I need for my tower project is a kiddie amusement park ride, especially one that I might have enjoyed on visits to Point Pleasant Boardwalk. The problem is the crowds in the summer. Weekends are impossible, but I thought I might do better on a weekday. Today was the first day this week I was home before 5 pm, though I did have to mow the lawn and wash some pots first before going out. 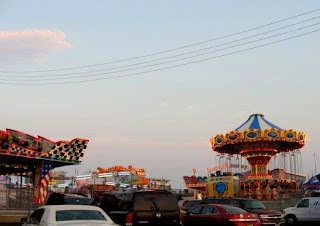 I seem to recall us parking on the street sometimes when I was a kid, but no such spaces were available anywhere near the boardwalk tonight, and I didn't want to pay $10 for a space in a lot for what was to be just a short visit. I eventually ended up in the free lot downtown, just had to walk almost a mile back to the beach. I went first to the ride area shown in the top photo to scout possibilities. Some that I remember from my youth are gone, replaced with more modern looking conveyances to travel in a circle for 2 or 3 minutes. But some classics were still there and I did some very rough sketches of the fire engines and boats (the latter rotating around through a circular trough). I can expand the sketches when I choose one for the block. Took other photos and did sketches of a few other items of interest that may appear in future prints. Work done, had a little fun just walking around the boardwalk. My dinner tonight was a cup of boardwalk fries and some ice cream. (at least I got a lot of exercise walking around town.) 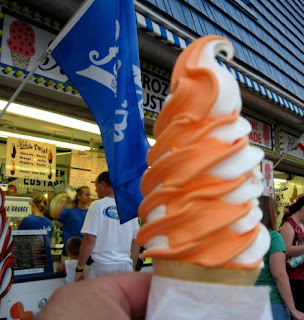 It's just not summer around here unless at some point you have a classic orange and cream cone from Kohr's, a fixture for generations on boardwalks up and down NJ. A nice treat for my hike back to my truck. Big changes on the mural since my last shift on the scaffold a week ago. New deep background buildings had been added over the weekend- condos under the route 35 bridge at the far left, houses under the Main Street drawbridge at the far right. Helps fill the space and establish more depth, as well as provide better separation between the water and sky. And the sky itself was lightened nearer the horizon, to reflect typical atmospheric colors. 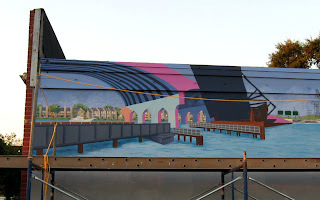 Tonight Pat worked on the middle deep background between the rail bridges and the boat, a previously underdeveloped area of the mural. Still has a little ways to go, but it better fits in with the work done at the far ends, tying it together. Click on the top photo to see for yourself. Meanwhile I set to work on the left side, dealing with the two railroad bridges. From our Siperstein's supply I selected 3 colors- Chamois Shirt (light brown), Harbor Blue (medium light), and Grand Grape (very dark blue). 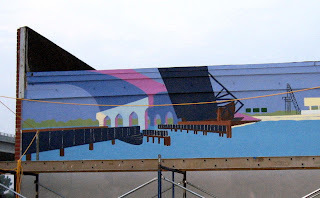 I first mixed them to make a fairly neutral gray, which I put over the dark areas above the wooden piers under the raised bascule rail drawbridge. I blended the same color with a little found blue/green and used it on the concrete pier under the water end of the fixed girder bridge that extends from the left edge. Still pretty neutral, but it separates well from the grays, browns, and blues all around. I then took the the gray and added more of the Grand Grape color to give it a little more blue, and used it to paint the spaced rectangles on the girder bridge, part of simulating the plate and beam structure. My labors are featured in the bottom photo. I will need to go back into the girder bridge another time, repainting parts with the straight Grand Grape color to emphasize the 3D aspects, as well as putting in some railings and other details, but that can wait a few days. Dropped by the Studio after my day job for a little while, long enough to rework some of yesterday's drawing. 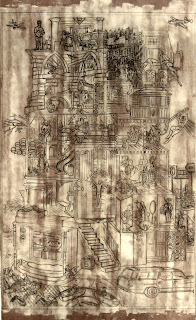 My solution to drawing Castelnuovo from the small photo was to do an enlarged sketch of the scene in a sketchbook first, then used that with my mirror to do the reversed drawing of the city on the block. That's what got me to this point. What's here is accurate, but I'm not sure if I'm satisfied. After looking at the results a while, I think I may want to shrink the scale a bit- I'll lose some detail, but I'll fit more of the city in the space. I'll think about it for a few days, then make a decision one way or the other. At that point I'll also deal with logos for the two tall interstate signs, which were also redrawn tonight. Today I moved over the the bottom right corner of the tower. 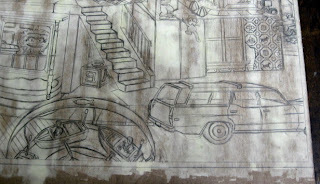 The station wagon already occupies the foreground, but I still need some background on that side. Most of my time was spent working on the train crossing. Even more than airplanes, as a kid I was really into trains. I played with electric trains, made art projects about trains, etc. And in an odd coincidence, I have lived pretty much all my life within walking distance of a train station. (Admittedly, the distance from my Bloomfield home to the train station in Montclair is a long walk, but it's one I've made. Wall to Belmar was almost as long, but again, a hike I've done. Distances to stations in Williamsburg and Carbondale were considerably shorter, and now I live about 4 blocks from the Manasquan station.) The visual reference for the block is more midwestern related. I put in an ADM hopper car, something I would see very often rolling past the Glove Factory. Just beyond the train I started putting in some very tall highway signs- you don't see these much around NJ, but in the midwest you see these from the interstates, so you can spot fast food, gas, and motels from miles away. Just behind that I started sketching in the hillside Tuscan town of Castelnuovo di Val di Cecina, one of my ancestral hometowns. Here it represents the part of the world that gave birth to the Renaissance, which influenced all western art that followed. The photo I had with me today of Castelnuovo was too small to provide the detail I need, so I'll have to get back to this another time. For all those who can't get enough news about the new BAC t-shirt, here's the latest. The print has been scanned and submitted by e-mail to the person who will be printing the shirts themselves. Back in the day we used to hand draw images right on the screens, or get fancy and use photo emulsion to burn the image onto the screen. Now a computer seems to be involved. But so was a piece of wood and some knives. I'm also told that we had to make a small change in one of the shirt colors, as one of our choices wasn't available. But I hear that the new color is fairly similar to the original it is replacing, so the shirt should still be pretty nice. With my part of the t-shirt out of the way and other short term priorities taken care of, I was free to return to my tower project today. What's left is to deal with is the space around the tower, which I've been thinking about off and on since my last work on this block. The ideas are being drawn off the original list of influences for the tower, stuff that didn't make it into the structure itself. 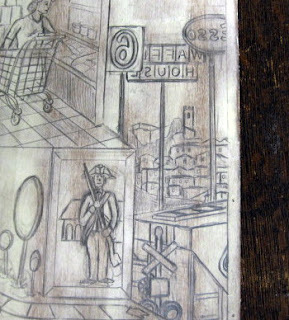 Today I started working the lower left corner of the block drawing. Closest to the tower I started putting in a boardwalk- wood in the front, extending around the back, where there is a typical railing and a beach beyond. Out of the horizon is a bit of Hokusai's Mt. 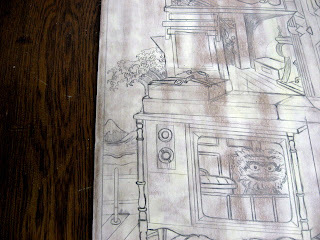 Fuji and the famous wave (above the tv), representing Japanese woodcuts in general. Although my prints are far more influenced by western printmaking, the Japanese approach to 2D art has impacted on my work, especially in composing within the rectangle. I don't make use of the beach as subject matter in the way that so many of my fellow Monmouth county residents do, but it does figure prominently into my most well known portrait piece, that of the former Kathleen Dillon (which often ends up in the background of newspaper photos of me). I haven't really done much with boardwalks yet, but there are a few ideas in my head. When I talk about boardwalks, I'm thinking of those with amusements, such as Point Pleasant, Seaside, Wildwood, and Atlantic City. As a child a visit to the boardwalk in Point was always a summer highlight- kiddie rides, games of chance, pizza, ice cream, skee ball. As part of a recreation job I had for several more recent years, I probably made over 100 visits to the various ones listed above. These days it's not quite so magical a place, but always still interesting. Not quite done here yet. 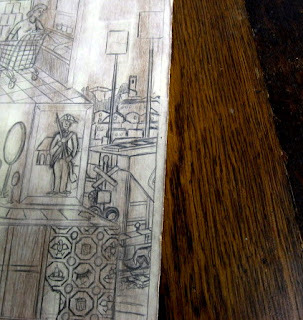 My plan is to continue this scene toward the left, with some type of amusement in the area under the rug and alphabet block. I was thinking of a spinning wheel game, but the space may be more conducive to a kid's ride. I think I need to visit a boardwalk again, do a little research. And maybe get some ice cream. This morning I found e-mail saying that I could drop off the t-shirt print at the Boatworks today if I wanted, so I planned to do that in the early afternoon. Meanwhile I went downtown to talk to our local chamber of commerce, to try to find out if I'm part of next week's second Manasquan Art Walk. I don't think that I had signed up for it, and there's a conflict with my summer job. But I was told that I was on the list, though I could have until next week to figure out if I would be participating. After stopping at home to pick up some stuff I took off for Belmar, a roundabout trip due to multiple detours I had to take to get away from traffic issues. No one was there at the Boatworks, but I was able to let myself in and leave the print in the office. I locked up and left for Ocean Grove. Before my work yesterday I had torn down a bunch of paper to the proper size to print supermarket prints, but by the time I finished my t-shirt project I decided I had done enough for the day. I had also brought several of the supermarket blocks with me yesterday, so those were ready as well. My visitors the other day had selected 3 supermarket prints that they wished to buy, and I offered to provide nice clean copies. It turned out that I had good copies of 2 of the 3 at home. I suppose I could have just printed one copy of the 3rd and been done, but the sale would clean me out my immediate supply of those other 2 prints, not to mention that I had discovered that I didn't have a single loose copy of #6 from the series (I do have one under glass, but that's not always convenient to carry around), so I decided to just do a bunch of printing at once. I printed one each of the the 2 prints I had clean copies of, two each of the other one I needed for the sale and the one I had no extras of. Because of the need to get the t-shirt image into production immediately, I added a little drying compound to the ink yesterday, and the prints were almost dry by the time I left the Studio. 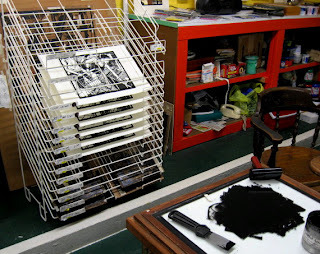 No such rush today, so no ink dryer, which means they need to dry in a rack for a while. The perfect opportunity to try out my new used/repurposed paper drying rack. As you can see above, it did a nice job holding the 6 prints, with plenty of room on bottom shelves for the blocks themselves, which will also need time to dry. Found an e-mail waiting for me this morning- the t-shirt fabric samples arrived late last night and would be waiting for me at the BAC to check out. I had reason to expect Pat would be up there painting right then, so I decided to go right away, get all this settled. Turned out she was there, along with a bunch of other people. The decision was made to go with a lighter shirt and darker ink, and after discussing some options we picked 2 shirt colors and one ink color that should work well with both fabrics. On to the next stop. In the afternoon I was at the Studio. 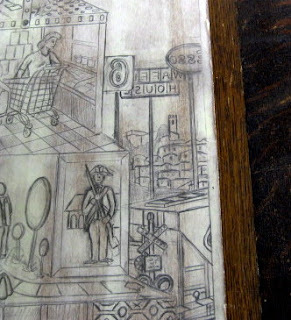 The first step (photo #1) was to reverse the lights and darks in the original pencil block drawing, except for the text. Next I cut the block (photo #2), the relatively simple design taking about 2 hours to finish. Got out the ink and pulled two proofs (photo #3), the second being the better one, as usual. The last photo shows the printed image. Normally this is where I'd call it finished, but since this is really just a step in the process. All that's left for me is to turn it in, after which it will be scanned, turned into a silk screen stencil, and printed in color on shirts. Results of that to be posted later. Tonight I decided to go to the Figure Workshop at the Belmar Arts Council. I arrived a few minutes late, and with 6 other artists in attendance, it wasn't easy to find a space to squeeze in. Never did quite get the feel of things tonight- sometimes you just don't have it. 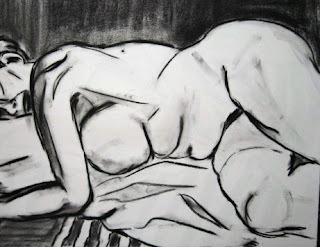 The drawing above (charcoal, 25 minutes) was the best from the session and I'm not entirely happy with it. Still, two hours spent drawing is always a great way to pass the evening. Next session is planned for Wednesday August 29, 7-9pm. For more information, see the BAC website. Besides doing some drawing I had an ulterior motive or two for going. I wanted to see if the model would be interested in working for my upcoming college figure class this fall. No commitments yet, but she was interested enough to give me her contact info. Also thought we might settle some T-shirt business, but haven't heard anything new yet. Once the t-shirt stuff was settled, it was time to get back to painting. Quite a bit had been done since my last session last week- including completely repainting the Main Street bridge (far right in top image) and adding a bit of green along the whole length. Pat settled in on the right side, working on the raised Main Street drawbridge, while I worked the left. Up until now I had been using the Siperstein's paint straight from the can, but today I did a little mixing of various browns and blue, which I employed around the base of the raised rail bridge, the bridge counterweight, wood pilings lining the channel, and above and below the fixed rail bridge at the far left (all shown in the bottom photo). Sometimes these browns represents wood, sometimes the rusty surface of steel. Adding the browns had two effects. First, they help to build layers of space within the composition, assisting the 3D illusion promoted by the perspective. Second, using some of the same colors from the bridge at the far right in and around the bridges on the far left helps to unify the composition as a whole. I quit for the night after that around 8pm, with the daylight fading fast. It's looking good, but the further we get, the more difficult it is, as we have to think a lot more about color choices. 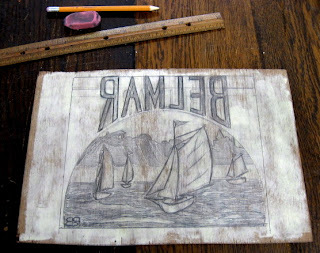 After work today I went directly to the BAC Boatworks, carrying the t-shirt block that I drew on Sunday. I showed that to our chair, along with some other text options, such as lettering examples from German expressionist prints, or the blocky simulated typeface that I use for the dates on all my Everyman prints, examples of which can be seen here and here. In the end the decision was made to stick with the lettering style from before, but greatly increase the size. However a new wrinkle has appeared- whether we're sticking with light printing on dark, or dark printing on a light shirt. I need to know what to cut and what to leave behind. I'm told that fabric samples may be available tomorrow and a decision will be made then. Luckily I can have until the end of the week to finish the print. Tonight I made the requested lettering changes, as seen above. After work today I went straight to the Studio. Molly and I were both doing a little cleaning- she was getting ready for the latest session of her current silkscreen class, and I was preparing for a couple interested in collecting some of my work. One of Molly's students came early to work on building a silkscreen frame, but otherwise I would take care of my business first. My people arrived on time, looked at the previously discussed work, and picked out an assortment for purchase. Since the copies I had today are a bit worn, I offered to provide nicer proofs, either from my stock at home or new prints if I don't have them. We'll settle up at delivery. When I got home I finally got my response regarding my t-shirt design. Generally positive, though a suggestion to maybe do something different with the text, bolder and either more like a typeface or more rough and hand made in quality. 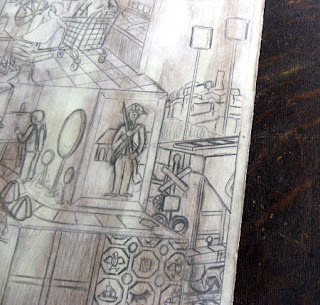 This comment was based on the marker drawing, not the later woodblock which deals with a these a little. I'm too tired to do much tonight, so I'll think about it, and bring the block and other ideas I might have by the BoatWorks tomorrow after work. Maybe by then I'll have a deadline to work against. Today's mail included the prospectus for the upcoming annual members juried show at the Printmaking Council. I will enter that one. Also got the prospectus for the next big juried show at the Art Center in Summit. The numbers in this one make chance of acceptance low, but there is a juror who comes out of the print/drawing world of museums, which may mean more an appreciation for prints. Deadline is months away so there's a lot of time to think about it. As of this afternoon I hadn't heard any official word from the BAC, but I'm not one to waste an afternoon. So I went to the Studio and got started on the block. 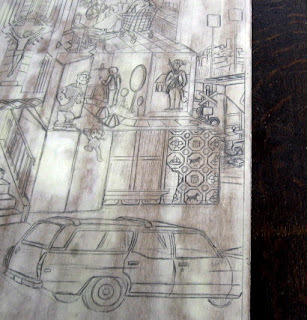 Cut a piece of wood, surfaced it, and did the drawing, which is essentially the same as the last drawing with ink, except for two significant changes- it's mirror reversed for the woodblock, and a negative, switching the black and white. It shouldn't take long to cut once I get the official go ahead. The cancellation of today's family fishing trip left me with some spare hours to use in the Studio. I arrived to find a lot of activity involving children. Molly, one of her students, and their various kids were on their way out, but moments later Molly returned with her dog, asked me to keep an eye on him until she got back. Normally when she leaves Barney with me for a short time he wanders a little, then lays down for a nap. Not today. He started barking and continued to bark for pretty much the next hour. Hard to concetrate like that, so I called Molly to let her know I'd be leaving him behind and took a walk to check out a show in a gallery on Cookman Ave in Asbury. When I returned an hour later, Molly had come and gone and Barney had gone with her, so I could settle in to a little work. Even with the distraction of all the barking I had come up with one new idea, changing the rectangle in the first version to a rounded top, and relocating the text to the center above. I sat down and finished my new pencil sketch, seen above. Had to leave at the point for a family dinner with out of state relatives, but in the evening I used a marker and some drawing ink to take the drawing to solid black and white. I sent off the image in an attachment to the BAC leader. Assuming she approves, I can start cutting the block as soon as tomorrow. 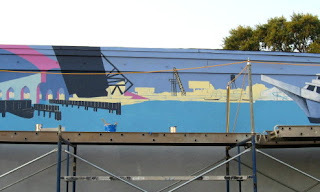 Went right from the Studio to the BoatWorks to continue on the mural. It had been noticed that the arches on the bridge at the far right did not quite line up, so the first step was snapping a chalk line to get a new diagonal across the whole span. 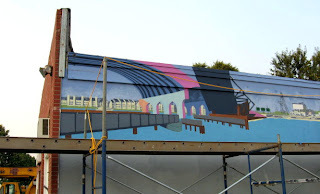 Pat pencilled that in while I got to work with the dark paint, finishing the long piers, the support beams around the raised railroad bridge, the crane in the middle, the water tower, and bottom paint on some small boats. (see bottom photo for my contribution) Pat went inside for a meeting, but our professional consultant Beth (shown working far right) stopped by briefly and started repainting the bridge. The upper part is now fixed, but the lower arch will have to wait for another day. With all I have to do the next few days, my next mural shift won't be until next week. About a week or so ago, while I was up painting on the scaffold, I was told that I had been nominated to design a t-shirt. 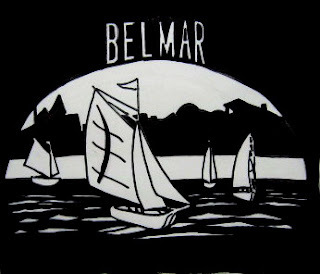 The occasion is a regatta organized locally, and the Belmar Arts Council was invited to produce a shirt in connection with the event. 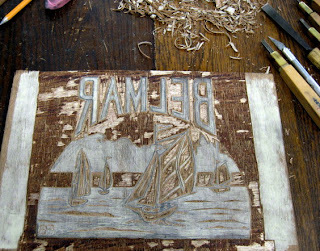 Waited a while for details that didn't come, so the decision was made to have me just go ahead and produce a design with a sailing theme- something that could go with a regatta or just be a t-shirt for sale at the BAC. 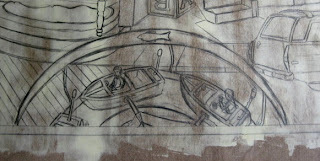 So today I went to the Studio with some boat sketches and started arranging. 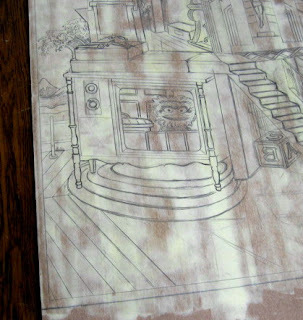 I had found out previously that the plan is to print one color, in this case light on a dark shirt. The view is toward the shore, so I decided to put a silhouette of the town in the background. 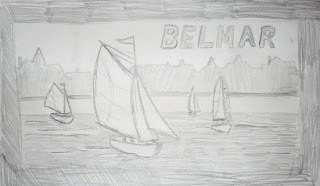 Images of Belmar houses would be preferable, but for this early sketch I figured Ocean Grove would do, so I took a walk to the boardwalk and took several photos of ocean front blocks. Back to the Studio for a moment to collect my stuff, then down to Belmar to continue some mural painting, which was followed by the monthly general member meeting. After the meeting I showed this sketch to the boss, who approved the direction. 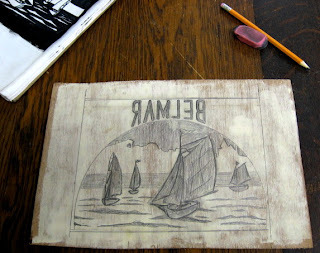 Next step is a more finished rendition, and if that is approved, I'll cut a block. I learned tonight that they want the shirts ready in 2 weeks, so I'll set aside my tower project until I get this done.